A linear throttle curve (default) to the left and an adjusted throttle curve to the right. The throttle curve to the left is linear so the throttle is always in parity with the throttle stick. When the throttle stick is set to 50 percent, the throttle is 50 percent. This is normally the default throttle curve. Depending on your multicopters setup, the multicopter will hover at different amounts of throttle. In the left throttle curve I illustrated this by setting the hover point to 40-45 percent (just a random example). Since the throttle curve is totally linear, that also means that the throttle sticks position is a bit below center while hovering your multicopter. 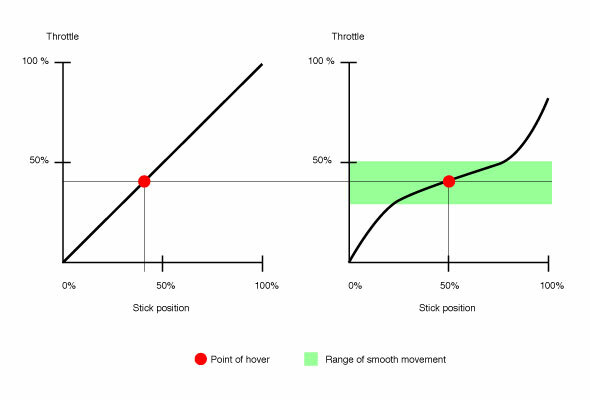 The throttle curve to the right has a hovering point that is moved to the throttle sticks center position. So when you leave the stick in center position, the multicopter will not change altitude (theoretically). This throttle is also flattened out near the hovering point (see the green area), which makes it easier to make small adjustments of altitude. That will eg allow smooth landings and take offs. The full throttle is also a bit cut off. A throttle curve like this can be useful for aerial photography and other smooth flying. If you fly more acrobatic, you will probaly need a throttle curve that offers more agility. For a beginner will proper throttle curve settings spare many unnecessary chrashes. Some RC transmitters lets you save different throttle curve presets. My transmitter, Turnigy 9X, can store three different throttle curves per profile. You can have one for acrobatic flying, one for aerial photography, one for heavy payload etc. I also own a turnigy 9x v2 and i wondered if you set your radio tx to heli or accro ? Hi, On a Futaba 9C in acro ( aeroplane ) mode the throttle curve is set under throttle needle so I guess the Turnigy could be the same. It really makes for smoother flying for video, but check where your power setting is for hover before adjusting around that setting. Can I reverse the curve ?